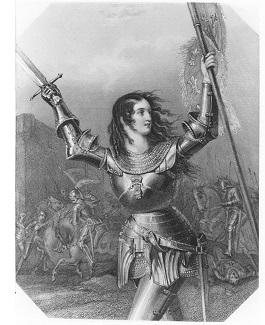 Joan of Arc (1412-1431) - French heroine who is credited with tipping The Hundred Years' War in France's favor. She was born a peasant in the tiny little town of Domrémy in northeastern France. Around the age of twelve she claimed to have started receiving visions from the Archangel Michael, as well as two women recognized as saints by the Catholic Church, Catherine and Margaret. These visions told her to support Charles VII as king and that she would help deliver France from the English. Her primary contribution to the war was at the Siege of Orléans, which was broken nine days after her arrival. The transformation from peasant to warrior began when she was sixteen and asked a relative to take her to the town of Vaucoleurs, where she met Robert de Baudricourt, the garrison commander of the city. She told Baudricourt of her visions and asked to be taken to the Dauphin Charles. Initially, she was dismissed as crazy. But she returned in January 1429, after the Siege of Orléans had begun. This time she had convinced two of Baudricourt's soldiers that what she was saying was true. And supposedly she made a prediction about the battle at Orléans which was confirmed by Baudicourt. Eventually he granted her request and sent her to Chinon, which was serving as the king's court at the time (Paris was under the control of the Burgundians, English allies). In Chinon, Charles VII met her with both interest and skepticism. For years, there had been rumors circulating of a maiden warrior who would emerge and rescue France, and Charles wanted to know if Joan could be her. He sent her to Poitiers to be examined by priests. They determined that she was sincere in her belief and at worst could do no harm to the cause. So Charles outfitted her in full armour and sent her to Orléans along with about 500 men. Her presence there is credited with freeing the city from the English siege (see Siege of Orléans above). However, her precise role is not known as the sources do not elaborate on it. Some historians argue her role was to boost morale and nothing more. Others say she advised the leaders of the garrison force. We'll never know. But she is believed to have fought alongside the troops. At her trial, one of the confessors stated that at the assault on the Tourelles (the fort guarding the bridge and river) she was shot in the shoulder by a crossbow bolt and carried from the battlefield. Rumors quickly spread that she had died, lifting English morale and sinking French. But the rumors were false. She removed the bolt herself and returned to the battle, reversing the morale of the two sides. After Orléans, the French began to believe that Joan was appointed by God. So when she advised Charles to go to Reims for coronation, Charles agreed. The English army had anticipated the move and marched to intercept Charles. The two armies met at Patay. The Batle of Patay is sometimes called "France's Agincourt". It was an overwhelming victory for France, with Joan once again credited for the victory (although her contribution is not really known). The march to Reims continued and the coronation of Charles took place on July 17, 1429. Now the English started to take notice of Joan as well. She quickly became their most wanted enemy. On May 23, 1430, the Burgundians captured her at Compiègne. They sold her to the English with whom they were allied. The English put her on trial for heresy (obviously a pretext to justify her execution) and burned her at the stake on May 30, 1431, at the age of only 19. Twenty-five years later, Pope Callixtus III exonerated Joan and declared her a martyr. In 1920, the Catholic Church canonized her as a saint.